Are you excited about your Wedding Planning Journey? Planning a wedding sounds exciting at first, it’s always like that but only when you start recruiting vendors, finalizing the venue, searching for the photographer, selecting the venue decor theme, getting perfect design for the wedding invitation cards it seems a lot of work to do. But worry not! It is very much possible to plan your dream wedding even if you are on tight budget. It just takes a bit of exercise. You need to be a bit organized in order to have the best output. Also, in a wedding there are lot many things to be taken care from decoration to wedding photography, caterer to florist, invitation to outfit, lot of things, endless decisions, lists, deadlines, vendors and, you yourself to deal. Sometimes it sounds crazy, how to see everything single handedly, but the best you can do is to take one step at a time. Also, don’t try to be a super-human in the process it is always advised to involve from a close family member to a friend who can help you throughout the process. There is no need to make your life miserable by taking every responsibility of your wedding. Give yourself time, trust your friend or relative for that matter. Otherwise you will end up being exhausted by the time you will reach your D-Day. The whole idea for planning a nicely organized wedding is to give yourself enough time to plan for that, a nice wedding planning takes around a year or so to be an organized one. If you are done with your engagement now and you have got your wedding date too. Now is the right to start planning your wedding, don’t wait for the ideal time and don’t have this notion that you have enough time for that as you have eight months in hand from now, you will never realize how soon these eight months will pass. So don’t delay! Start doing things otherwise you will go crazy at last minute planning and surely regret wasting time later. Wedding planning is much tougher than I think that it would be, Organization is what is needed to have a wonderful great wedding. You have to keep track of everything. Know that even with the most painstaking planning and organization system, there can arise some chaotic situation from time to time. Try your best to plan things and enjoy every moment, no need to be too hard on yourself. There are many ways to be organized…. How you ask…. Keep reading!! The first thing which you need to do is to create a folder or a binder wherein you can leaf through all the wedding related docs safe. Keep all the contracts, agreements, bills and everything saved here in this folder/binder for your reference. This is the easiest way to track all the expenses also. Before moving ahead with your wedding planning the first and foremost thing which you need to plan is to decide your wedding budget as it is very important to know the budget in the beginning itself. 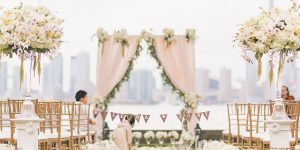 Your budget will be the driving factor for almost all the wedding-related decisions, so this is the first thing you need to have clarity with for the subtle functioning. While setting your budget, do speak to family members and close relatives too, they might also have planned some gift for you, talk to them and know how much they are planning to spend. This way you will save on money which you might otherwise spend on something which is already in your uncle’s mind to gift you on your wedding day. Remember that weddings are pricey affairs and you need to be vigilant while spending. Also, whatever budget you have decided stick to it religiously. Now as you have decided the budget, it’s time to see where and how to spend the money. You need to list out things in order of their priority. Sit down with your family and figure out everything from food to photography, Music to booze, venue to decor, as these are the most important aspects of your wedding. Listing things out will help you to stick to your budget and spend within your budget. 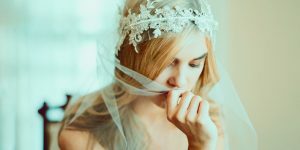 However busy you are but you might have always dreamt your wedding a certain way and now is the time to research your perfect look may be or the decor you would like to have on your wedding day, may be your makeup, everything related to your wedding you can research as there are many mediums to do so. Go through wedding blogs, Instagram, Pinterest etc. Also, you can search the wedding vendors online and accordingly you can start conversation with them regarding their pricing and all. 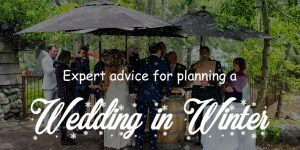 Well, your wedding is also an event, once in a lifetime one, it is the time wherein you need to use your organizational skill too to make it the most beautiful and memorable one for the lifetime. Every preparation you do for your wedding, should be kept in one place a folder or a spreadsheet. It should contain every detail of your wedding plan. 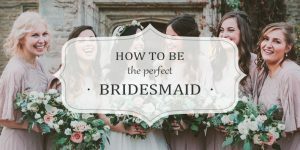 You can’t be a superhuman on your wedding, so it is good to recruit or take help from someone who you trust completely and you know that the person is able to handle all that is asked aligned with your choices and needs. Also, you can take help from your spouse to be, as its equal for both of you, it will be fun to plan together and be a part of the journey to cherish throughout your life the golden moment which you both will spend in doing things for your own wedding. Don’t just book the first venue you visit, or may be the one which your uncle booked two years back for his son’s wedding, two years is a good time for anything to changer in a good or bad way. Choose two-three wedding venues, visit all the three, get the details, and check their services. Also, read reviews online. Only when you find it a comfortable place from all the aspects to host your great event there, you can book it. Be it a destination wedding or a wedding in your own town. 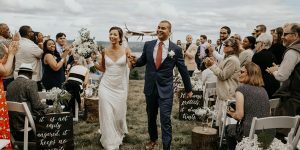 You may be finding it a lot of task to complete, or you might be enticed to meet the very first photographer, but that is not what is needed to host a great wedding. Patience is the key point while deciding something. Since you have myriads of options along with time, just compare all of them and then accordingly decide the final one. Now, this is a bit tricky task as you have to decide who will be the invitees in the event. Close relatives, friends, father’s friends, and mom’s friend and so on the list once you start to prepare with your family, the list will go unexpectedly lengthy for sure. If yours is a destination wedding, you need to be wise enough while preparing your guest list as it will directly affect your budget for sure. You might need to make some cuts only those you feel are necessary and their presence is important will be invited finally. Sit with your family and create the list in accordance. If your wedding is taking place in your hometown still book a wedding point or a hotel rather to do it in some open space. In a hotel or a wedding point they have their vendors and hence most of the things are taken care by the management of the wedding venue itself, like caterer, decoration, florist, music etc. All you need is to tell them what exactly you are looking for in your wedding. Also, there are rooms for the guests too, who can stay there at the wedding venue without getting much bothered by travelling part. If you have something special in mind related to your wedding decor or theme, do tell it to the vendor in advance as he will take care of the rest. Be it some special color you want in your wedding decor, or specific flowery decoration you are looking forward to. You might have attended many weddings by now even in your close relations. You can always seek their advice on Dos and Don’ts of your wedding as they have experience they are already married and they can guide you better. Don’t hesitate to ask for their help, it is always good to learn from others mistakes rather to repeat them themselves. They can be the best source, trust them. When you will start searching for wedding vendors you will encounter many of them. Just don’t hire them for your big day as they told you few rosy things, better get reviews about their services and see whether they are good at their work or not, it is not just enough to have a vendor, you need to be comfortable with the vendor. No matter how much time it takes to finalize the vendors but go with the ones you are comfortable with, otherwise you will feel exhausted. For sure you have fixed some budget for your wedding dress too, wedding dress shopping is fun, especially for brides it is super fun, and in flow people just go beyond their budget only in buying their wedding dresses. That’s fine you want to look different on your wedding but that doesn’t mean you will go beyond your budget for that. It’s better tell the designer or the store manager your budget in the first place and accordingly see dresses in that budget only. You will surely get dress of your choice in your budget too. You also know that wedding dresses are hardly used in any function later after the wedding. I won’t say that it is sheer wastage of money as it’s not just a dress but one’s emotions and sentiments are attached to it. Still, you need to act wisely while shopping your wedding outfit. Also, just don’t buy the first dress you come across, see options, in different stores too, and compare prices. You never know, you might get the same dress which you saw in other store the other day is less expensive in the one you just entered. Be open about your budget, style while buying your wedding outfit. Oh you don’t like reading those big documents, but trust this is crucial! Yes, it is crucial to read all the contracts thoroughly. Ensure all the details are correctly mentioned, especially read through most important things like payment and cancellation policies before signing. Also, check it twice or thrice that the venue, date and event times are correctly mentioned in the contract. Otherwise you know…. I don’t think I need to tell..!! Well, printed invitation has its own charm no doubt, but if you have a budget constraint you can always go with an online digital invitation method. Everybody uses smartphone these days and it is easily accessible also. This way you can save your money. Also, making enchanting wedding invitation is not tough task it is in fact a new DIY culture, making wedding cards and then circulating it to all the nears and dears requesting them to save their dates for your big day. Your wedding is possible only when you have an officiant or pandit who will say verses in your wedding. In the peak of wedding season, it becomes really tough for one to get the good officiant so it is good if you book one well in advance to avoid last minute chaos and compromising with the not so good officiant. You time and you should plan things way too ahead. Don’t take too much of pressure of the traditions, if you don’t find yourself comfortable in any tradition you can skip it. Either you can make few amendments in the tradition as per your wish this way you can have a personal touch also or you can skip. Make a list of most important ones and just stick to them and go ahead with them only. Too many traditions makes one exhausted. Don’t get too bogged down by Tradition, if you are not comfortable with some tradition, skip that one. As you know that your wedding is a once in a lifetime occasion, you must know this also that you must look the best in your big day which is only possible when you will make time for your beauty regime. It’s not that, that you will visit a parlor just a month before your wedding and everything will fall in place. No, not at all, all the pressure, exertion, you have taken for all these months to prepare for your wedding will not go all at once in few parlor visits. For getting that bridal glow you have to follow a beauty regime which starts at least a six months prior to your wedding. Look beautiful and be beautiful… ☺ ☺ your wedding is no ordinary event. Your wedding is a big event and always remember go with what you want and how you want it to happen as this is not going to happen again. SO this is the only and one chance to have your fairy-tale wedding come true for you. It is not necessary that you and your family members are on same page on this, but you can very politely convey your wish to them too. Every family has their own ideas and opinions regarding a wedding but at the end you have to remember that it’s your wedding and you should make it happen your way. There is no point going against your own wish just out of respect or anything. Be open and frank about it. Your family will surely listen to you. Gone are those days when you had no stand, now you can speak up for yourself. Now it’s the day which you have been planning for, it is very important to know in advance when vendors can start setting up at the venue. 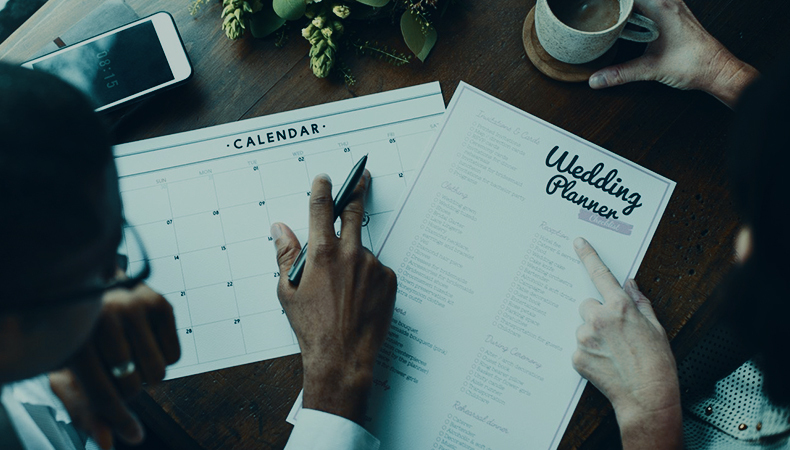 If your wedding is taking place in a hotel, make sure that you have the timing for set up well in advance, if not then check with your hotel staff. There might be some event going on already, still your vendors needs to be updated about it on time to get things on time. Otherwise it would be awkward for you to see that guests has started arriving and still the vendors are doing their job due to any reason. Your wedding is no less than any grand event, it is advised to create a flow of the events when what will happen and who is going to coordinate. You might have planned few games for the friends and relatives, who is going to coordinate there has to be mention of that. Your wedding photographer is ready to capture family shots who to capture will be told by someone who has been assigned the job as you will not be able to leave stage and intervene in between that this needs to be done. A flow along with the names of the people and vendors who is doing what is always good to go for smooth functioning. There must be certain things which you won’t like, if you don’t like you have all the rights to open your mouth and tell what is wrong and where. It’s not just about your wedding but you have all the rights to put forth your point of view regarding something which you are not liking or something which is not happening a certain way you have decided at the first place. There’s no reason to do something that distress you. If you are tight on your wedding budget than you should that there are tons of ways to save money on your wedding. Wedding is a costly affair, no doubt but still you can save money on several things, one is your wedding venue, your number of attendees, your decor, your outfit, your wedding photography (you can have a common wedding team for photography from bride and groom’s side, no need to go for two separate teams), likewise there are so many options available to cut cost on your wedding. This is not your exam for which you can prepare a night before and still able to get good score, this is your wedding mind you and if you are the one who loves to do things later or last minute than this is not a great idea in this case. It is always good to start preparing way ahead to avoid last minute chaos and also avoiding unnecessary pressure and worrying at the last moment. Even if you want everything perfect in your wedding, over involvement will only exhaust you. Take a break in between, make time for yourself and for your spouse to be. Breaks are very much needed in between as it keeps thing healthy flowing otherwise you will start to feel bore and gradually lose all your interest in the process. Just chill out…. And trust you have recruited the right people for the job. It is very important that you don’t forget to sign the contract or agreement to avoid any chaos in future. No matter your vendor is your friend’s cousin or who, it is important to keep things legal and clear in your wedding. If you will miss on this important aspect of your wedding preparation, than chances are later you will regret your decision of not signing the contract or agreement. It’s good to go by rule! If you are tight in your budget, looking to save money than it is good to have some gap between your wedding and your honeymoon, otherwise it will be very costly to plan both the two at the same time. If you you’re your honeymoon after few months of your wedding, you will get enough time to save for your honeymoon and will be able to have a great time at your honeymoon later. Now it doesn’t matter much which type of wedding it is, it is not mandatory to make it legal. Don’t forget to do the needful. Last but not the least, have fun. It is your wedding and you should have all the fun amidst all the crazy shopping and planning. That is what you are going to miss after your wedding. The time which you spent to make this event possible. Now it might look that it is only a two or three day’s event but sincerely if you start to spend time in preparing for it, it will take a year to plan a good, memorable wedding. Everything related to your wedding planning you will memorize when you will sit your partner and talk about how you went crazy at certain point when you were not able to get the right shoe match for your outfit, or may be about the photographer who just missed to bring the props for a particular couple shot and then your best friend saved you in the situation. All these things may seem small right now, but are lovely memories to cherish forever.